On 14th May two of our board members, Chula Bruggeling (vice chairman) and Twan Elting (Gameplay), travelled down to the Sport & Congress Centre Papendal for the Dutch Sports Convention 2018. This convention, organised by NOC*NSF, was a unique opportunity for both them as Quidditch Netherlands to gain new knowledge, making connections and to give quidditch more publicity within the world of sports. Below a short report by Chula. 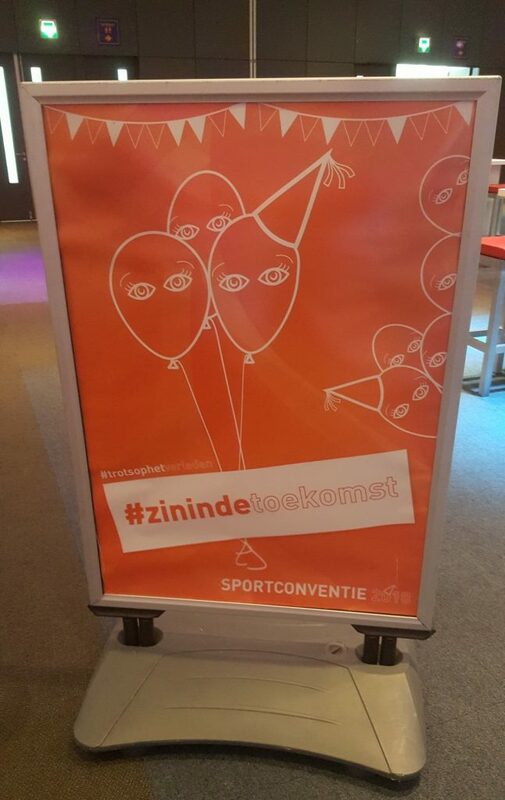 The two main themes during this year’s Dutch Sports Convention were #trotsophetverleden (proud of the past) and #zinindetoekomst (looking forward to the future). Mostly the second theme was one where we could relate very well. Beforehand we didn’t know what we could expect of a day like this, but we trusted that we could learn a lot at the sports convention and hopefully gain useful contacts for the future. During the convention we’ve attended multiple sessions where several organisations and departments of the NOC*NSF talked about sports related subjects. That’s how we gained knowledge and new insights about a future-proof sports board, association directors, digital marketing (for events) and the AH sports activity/National Sport week. The useful information and knowledge of this afternoon will be written down (digitally) as much as possible and used for general improvement within QNL. Anything relevant will also be passed on to several teams (such as information about the National Sports week in September). There was also room for networking. We have exchanged several business cards and had some interesting conversations. In response to all our networking we have already received a couple of emails and we also send out some emails ourselves, discussing subjects such as training possibilities for coaches and trainers, problems and start-up issues among small sports federations, diversity in sport, and admission requirements and quality requirements for sports federations / members of NOC*NSF. As some of you might have already noticed on Twitter, our networking also resulted in new followers from the general sports world. Next to that we also made a couple of personal LinkedIn connections. All in all, it was a useful and interesting afternoon. Regarding the admission requirements of NOC*NSF, the mandatory membership of the IQA within the Global Association of International Sports Federations (GAISF), formerly known as SportAccord, is unfortunately beyond the control of QNL. We do, however, appear to comply with the other admission requirements (as soon as the statutes are submitted to the notary this summer and QNL becomes an association with full legal capacity) and in the next few years we are able to work on the latest quality requirements that have not yet been met. After a joint evening meal, the representatives of more than one hundred Dutch sports federations officially met for the semi-annual General Meeting of NOC*NSF. Because of the link with this sports convention, it was also possible for interested parties in general to be present, and to look at how this works for such a large association. With a large projection screen, microphones and cameras everywhere in a packed room it certainly feels impressive. Looking at the other attendees it was soon clear that we certainly were the youngest attendees. Though representatives of the Skateboard Federation Netherlands (based on their appearance they were at least 10 to 20 years younger than the average member present) fortunately made that we did not feel completely out of place. A financial annual report showing tens of thousands of euros on the screen shows once again what kind of meeting we were attending, especially after we noticed the memorandum which indicated that all amounts had to be multiplied by 1,000. That’s completely different from the type of discussions we have in Quidditch Netherlands, where 50 euros more or less within the budget already is a very serious issue. Another difference is the general annual report; a complete book was on display at the presentation board, and on the laptop of one of the attendees in front of us we could see that the digital file covered around a hundred pages. There were also topics that are directly relevant to a sport association on a scale as QNL. For example, the presentation of a national report on sexual harassment and sexually transgressive behaviour within sport, carried out by an independent committee, and the changes based on this report and the recommendations of this committee. Although we like to see quidditch as a large community of great people, it always remains important to reflect on the fact that sexual harassment and sexual abuse can also occur within our sport, and that strict and clear rules must exist. Quidditch Netherlands has been working for some time on a general disciplinary regulation, and a more specific regulation on undesirable behaviour (including sexual undesirable behaviour). We are currently trying to obtain the report and the recommendations from this committee, so that we are as well prepared as possible if something ever happens. The general meeting was closed with a positive note: A look back on the Olympic and Paralympic Winter Games in Pyeongchang. The two national team leaders of the Olympic and Paralympic Games, reported on the experiences in Pyeonchang, from the achieved results to points of improvement for the future. All was concluded with two beautiful retrospective videos. It was very special to be present at a presentation like this, especially when you realise that the people in this room are ultimately responsible for almost all sports within the Netherlands. From the local club teams to the Olympic and Paralympic Games. And hopefully, somewhere in the upcoming years, board members of Quidditch Netherlands will be present in this room not only as general interested parties, but as official members. That is what gives us #zinindetoekomst.